* Portions of this book were previously published in: Survive the corporate world and go freelance as a creative designer. Where does it go wrong for so many creatives? Why do many of us end up burning out from our jobs? You left everything to focus on your career. You have always been excited and enthusiastic about work. You even got a job at a “great” company — one most people would love to get. But no one told you that making a living as a designer is not as easy as it seemed. No one told you how to be prepared to get your best ideas rejected. How to be ok with being interrupted continuously. No one told you how to deal with a lack of a life outside the office. Or how to cope with people with big egos whose sense of taste is questionable. The creative industry, whether you are full-time or freelancing, offers a world full of opportunities where creativity can flourish, and our careers skyrocket, although nothing good comes easy. You want to work with people that value and respect your decisions. You want to design without a rush. You want clients that pay on time. You want to have a good work-life balance. And most of all, you want to do work you are proud of. 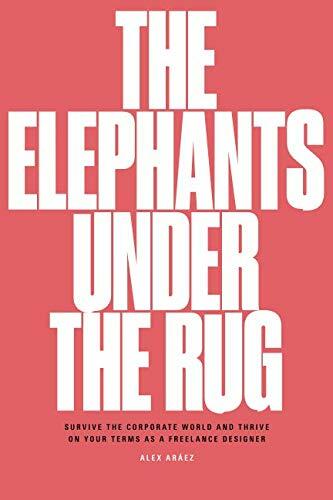 The elephants under the rug is a wake-up call to an industry constantly evolving on the outside, but stuck on the inside. It points out some of the most common problems the industry faces internally. The ones that make talented people leave or burn out. The ones about poor creative work, inefficiency, employee mental health, unsustainable workloads, and big egos among others. I wrote this book hoping to do two things: prevent talented creatives from getting overworked into a burnout, and offer some realistic encouragement to those who might enjoy becoming independent as a freelancer. To do that, I’m just going to tell the truth. I’m going to say what many people can’t – or won’t – say. Because you need to hear it.